Mole crickets are a serious problem on the Florida Gulf Coast. Appearances of these species vary, but most mole crickets have cylindrical bodies and grow to lengths of about 3 to 5 centimeters. The three main species of mole crickets are the southern, short winged and tawny. Their hind legs are poorly adapted to jumping, but they are capable fliers. Mole crickets generate more turf damage than any other pest in Florida - much of this damage is a result of their tunneling behavior. Mole crickets have oversized, shovel-like forelegs that they use to dig through the ground, leading to soil displacement and damage to turf grass. They also eat the roots and shoots of grass. 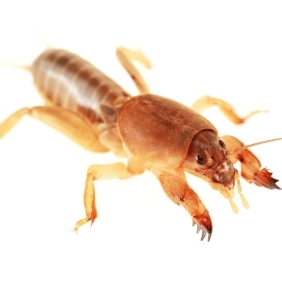 Mole crickets are nocturnal and spend most of their lives underground, making them difficult to detect. The main indicator of a mole cricket infestation is the raised ridges on the surface of the soil created by their tunnels. You may also encounter small mounds made of dirt scattered throughout the area. You may notice patches of dead or dying grass. Predators such as armadillos or raccoons might also start to dig up the turf grass feeding on the mole crickets. Venice Pest Control has served the residents of Sarasota and Charlotte counties since 1974, and lawn pests are one of our main areas of expertise. If mole crickets are damaging your lawn, our experienced technicians can get rid of them in no time. Customer satisfaction is always our top priority.